21 Artists – my project in downtown Chicago where 21 artists temporarily set up shop in a vacant storefront – started with a bang, featuring two visual artists, an illustrator and a graffiti artist, on its introductory day of February 1st. The overall objectives include providing a place for artists to come to the space to create work, engage the public and provide opportunities to collaborate both within and across art forms. During their featured day, each artist created new work inspired by a quotation that somehow described their artistic process, chosen prior to that day. Rather than a mere exhibition or performance, the pop-up served as a living workspace and studio, a hub for the arts and community during the 21-day project. The project has had an incredible response as far as the level of engagement and the quality of work being created despite the challenges presented within creating work in a pop-up space presents. Ultimately, anyone utilising a vacant space for any project of this nature at no cost is at the mercy of the building owners and their agendas for the space, requiring the navigation of often strict rules and restrictions such as noise levels, space limitations and the reality that, ultimately, their goal is to lease out the space, so whatever they need to enlist in order to make that happen as soon as possible is standard protocol. Though working within the framework of a pop-up space presented some hurdles along the way, the project did indeed serve to achieve those goals, many artists coming to the space to not only showcase their creative talents but to provide a platform to share what they do with other artists or people who happen to pass by the space. 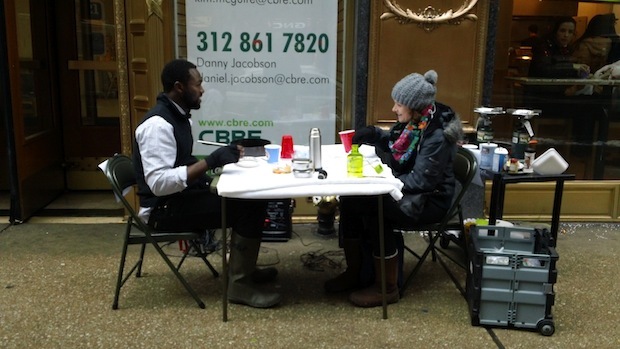 For example, the fourth featured artist, filmmaker and performance artist Abbéy Odunlami, cooked a five-course meal on the sidewalk on a chilling February day in Chicago’s winter, asking passersby to sit and share a course of the meal with him over meaningful conversation. Prior to his featured day, he asked friends and colleagues to submit quotations to him that were then placed in a bowl at the center of the table for the meal guests to choose from, sparking conversation from the places where memories reside to childbirth to dreams and visions for the city of Chicago. His project had a fantastic reception, drawing attention from many who passed, overwhelmed at times with willing participants, bringing together students, business men and women, working class Chicagoans and homeless people, all eager to sit and eat warm food shared with others. Many of the featured artists involved with the project found ways to make the most of this high visibility, non-traditional environment by going out into the public environment to engage with the busy and bustling city centre despite the often frigid winter temperatures. 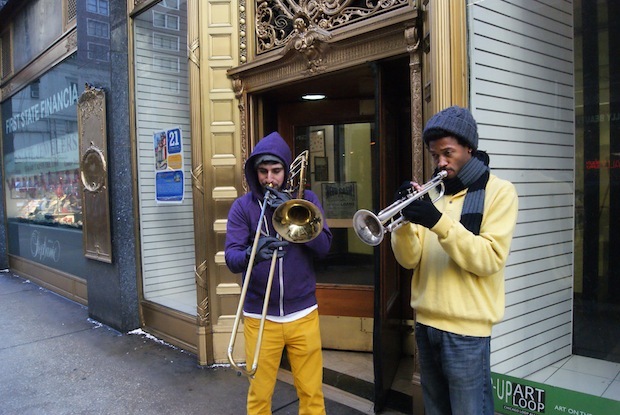 In addition to the interactive meal, a musical duo called HornBreaD, comprised of a trombone and trumpet player, performed with a spoken word poet and MC in front of the project space, collaborating with people on the street and entertaining those who passed by. Photographer Lindsay E. Schirk went around Chicago’s city centre and iconic Millenium Park, asking pedestrians and tourists to take fisheye portraits that were later turned into paintings. 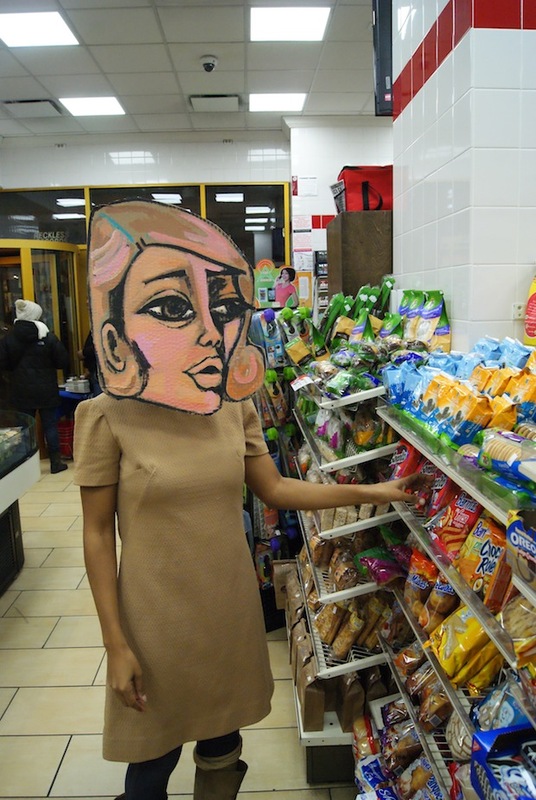 Performance artist, Natalie Osborne, wore her larger-than-life cartoon-like masks around the city, shocking and intriguing many she encountered. Artist Sam Kirk chose to tackle the theme of homelessness, walking the streets picking through garbage and sitting on street corners in order to understand a bit more about homelessness to inspire her piece. Beyond the public engagement element, the project has provided a hub of artistic activity, providing artists the opportunity to collaborate across art forms. As well as being a painter, illustrator and artist-residence during the event, I collaborated with Chicago-based poet and MC, Rico Sisney to host an artistic “cypher” that not only provided a platform for collaboration but involved full audience participation. This ignited a creative “conversation” amongst people who attended, culminating in a final performance which highlighted our talents and fostered a safe space for participants to express themselves in response to their experience and share out with the group at the end. The dance group ‘Core Project Chicago’ used the quotation they chose to inspire a dance piece involving four participants that was built from start to finish during their featured time there. Other artists collaborated with me or created work on their own during their featured day, providing an exemplary demonstration of how the diversity of the whole is much greater than the sum of its parts. Congratulations on pulling off such a great project!